Today we will learn about the base materials used in above ground pool construction. There are two types that are most commonly used in above ground pool construction. 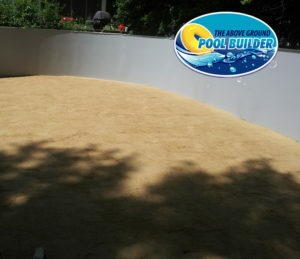 Above ground pools require a base material to be laid for the construction of the pool. 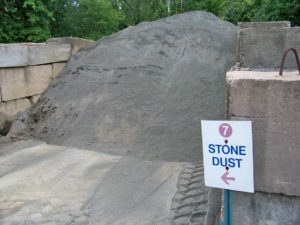 Mason sand or stone dust base material is used most often. Mason sand, also known as pool sand, will create a very smooth bottom layer and is the most popular choice. The sand is thoroughly watered down then tamped to compact the sand, finally it is smoothed with the back of a push style broom. If installed correctly the sand base floor will not have any major divots. When your pool is completely filled with water, this base material will be just as hard as most in ground pool bottoms. The tamping by installation crews, along with many tons of water will compact the sand into this smooth but hard layer. Mason sand will vary in costs around the country, so you will need to check with your local landscape supply companies for local charges. For a list of suppliers in your state please refer to our “services section” of our web site where we have taken the time to list all the services related to above ground pool construction. Stone dust is the other option for your pools base. It is a base made up of crushed stone and gravel turned into dust that will create a hard, cement-like bottom under the pool liner. This may create problems later in the pool’s life when sharp pebbles may begin to poke into the liner. To prevent this, we suggest laying down a protective layer between the base material and the pool liner. The two most common underlayment options are “Armor Guard” and “Rolled Foam”. Armor guard is a prefect geo engineered fabric that is extremely strong. Rolled foam is condensed style foam that is specially made for pool applications and will not take on moisture. People hear foam they first think of its sponge likeness but this is not true with this rolled foam. Both of these options will provide protection from rocks or sharp pebbles. They also add a layer of cushioning that for your feet as you walk in the pool. These foam pads are not visible since they are between the base material and the liner. To get the sand to your home, a heavy-duty pickup truck or small dump truck is used. This material is dumped into the previously excavated pool construction area and spread by the installation team. One last bit of information about base material, it is always a good idea to use stone dust under the blocks that support the uprights of your pool. The materials chart gives you the correct amount of stone dust you’ll need to do the entire project. If you are using mason sand then you will need approximately 50 lbs of stone dust material for the block setting. You could easily purchase a 50lb bag from your local Home Depot or Lowes. Additionally, it is important to know about base materials to spread around the outside of your pool’s perimeter. Your base material isn’t complete until the outside is complete. Materials spread around the outside of an above ground pool has a purpose in addition to looking good. Yes, having an area near the pool can be attractive but it needs to keep as much moisture away from the wall as possible and it needs to act as a structure the pool sits in. We recommend the use of landscaping rocks around an above ground pool. The rocks can be anything you like, from pea stone all the way up to 2 inch wide rocks. You want to stay away from materials like mulch because it holds moisture close to a pool which could accelerate the development of rust. You also want to avoid stones that are acid washed because these stones will also create rust sooner. For a list of landscaping companies please visit our services page. There you can find listings of hundreds of landscape supply companies across the U.S.A.